Two new full-cast recordings from The Online Stage! As a member of The Online Stage, Lee Ann was happy to play small roles in two new full-cast productions just released on Audible. 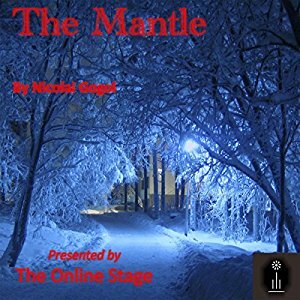 In The Mantle by Nikolai Gogol, Lee Ann plays the landlady and Akaki Akakievitch’s daughter. “The Mantle” follows the life of a civil servant, Akaki Akakievitch who just loves his work! Born in St Petersburg, he is a copy writer, meaning he copies text from one place to another. In his spare time and after work hours, he also copies. When given more responsibility, he begs to return to…copying. One particular winter, he notices that, between home and office, he is cold, his mantle is threadbare, and he can no longer repair it himself. Our conflict begins here, as Akaki seeks a solution to his threadbare mantle. Nicolai Gogol is a wonderfully observant author and his characters are so rich that we feel we can understand their points of view. This tragicomedy is Russian society in the mid 1800s at its most delightful! Produced in cooperation with Listen2aBook.com, you can listen to a sample and/or purchase the recording here. The second production is a full-cast version of the beloved children’s classic Alice in Wonderland by Lewis Carroll. Lee Ann plays the parts of the cook and the old crab. Alice is played by a very talented 7 year old, Miranda Hodges. “Join seven-year-old Alice as she tumbles down the rabbit hole to have an adventure in Wonderland, in Lewis Carroll’s classic novel beloved by children and adults alike. 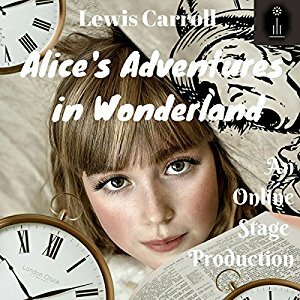 Alice encounters many strange and curious creatures in Wonderland, including the anxious White Rabbit, the rather unhelpful Caterpillar, the disappearing Cheshire Cat, the Mad Hatter and his guests at their tea party, and the horrible Queen of Hearts. All proceeds from their sale of this audiobook will be donated to Charity Water, a non-profit organization which is dedicated to the building of sustainable, community-owned water projects around the world. Posted by lahowlett on February 10, 2017 in Uncategorized and tagged Alice in Wonderland, audiobooks, Charity Water, children's classics, Lewis Carroll, Listen2aBook.com, Nikolai Gogol, Russian classics, The Mantle, The Online Stage.